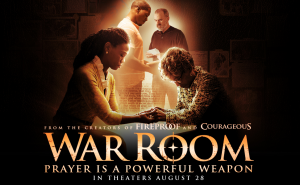 The War Room is a winning film about prayer. A film about prayer? How do you make such a thing? Why would you make such a thing? Who would make such a thing? Obviously, the Kendrick Brothers are at it again (Facing Giants, Fireproof, Courageous). War Room is their best yet. It’s definitely a film about prayer, but in the context of a troubled marriage with a meddling older wisdom figure (Miss Clara played by Karen Abercrombie) who lends a smidge of narration and lots of pragmatic advice. That’s the thing with the Kendricks’ films. They stand alone as solid entertainment (and not “message films” per se), but they leave with you the most practical examples of what to do in your own life. Tony (T. C. Stallings) and Elizabeth (Priscilla Shirer) and their adorable daughter, Danielle (Alena Pitts), are living a cold, hard existence under the same roof (that is, when Tony is even home). Something’s gotta give. Enter Miss Clara, whose house Elizabeth, a real estate agent, is selling. On the surface, Miss Clara is a sweet, doddering old woman, but underneath she is a shrewd, don’t-mess-with-me, Jesus-filled overcomer who gets all up in Elizabeth’s business and begins mentoring her. Things are not exactly as they seem. People are not exactly as they seem. When you think you have some of the characters figured out, there will be reveals that only make each character more and more true to life. You will recognize your own habits of thought and “stuck-in-a-rut” patterns of behavior that are all too painfully true to our own lives. Miss Clara unlocks doors to new ways of thinking and acting that are more in accord with reality, make sense, and yield results. Marriage and family have been underlying themes in the Kendricks’ last two films (Fireproof: unconditional love, Courageous: fatherhood), and now: how to let God truly be the Lord of your marriage, your family, your home and your life. But the Kendricks never sugar-coat anything. They go there. They get into the nitty grits of people’s lives and never offer easy “Just give your life to Jesus!” “Let go and let God!” “God will bless you if you just…!” solutions. The genius of War Room is manifold. Just the thought of “a film about prayer” could make the holiest Christian pastor tremble with boredom. The scenes and dialogue sometimes live on the edge of a deep plunge into “hokey ravine”–but that never happens (only highly-trained and talented professionals can do this, do not attempt this in your first film). War Room is a clinic in filmmaking. So much of today’s filmmaking is just lazy. War Room is anything but. It’s tight, precise, intentional, with razor-sharp timing. The acting and cinematography is impeccable. Reaction shots are perfectly timed, perfectly executed. The style is almost soap opera with so many intimate close-ups, and yet half the time, the poignant moment erupts in unexpected humor. Masterful. The visual gags are laugh-out-loud hysterical (as are many of the verbal jokes). 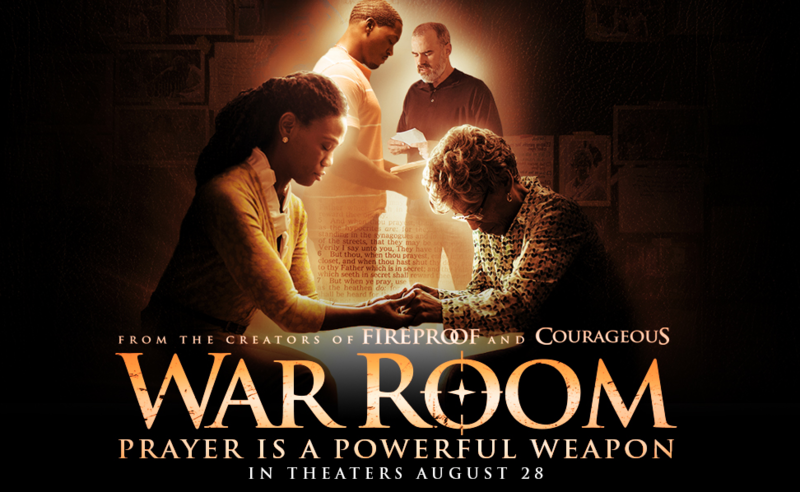 War Room is gravity and joy together at one and the same time. Like life with God generally is. How does the Christianity in the film jive with Catholicism? The Kendricks are Baptist ministers in Georgia (with a delightful Southern sensibility and sense of humor), but they keep strictly Protestant tenets out of their films for the most part. 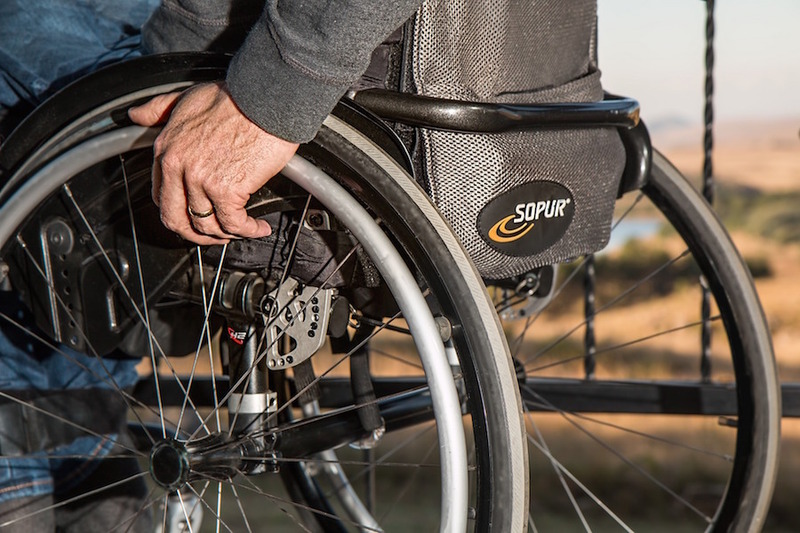 The Word of God shines in this film: our need to engage and pray with the Scriptures, to stand on God’s promises, to beg God in prayer at times, to make the Bible central in our homes. Our characters are nominal Christians who must learn how to pray. Daily. From the heart. In case we’ve forgotten that prayer is also spiritual warfare, that we need to bring our personal and other battles to prayer and let God fight for us and those whom we’re praying for? The War Room is our refresher course. 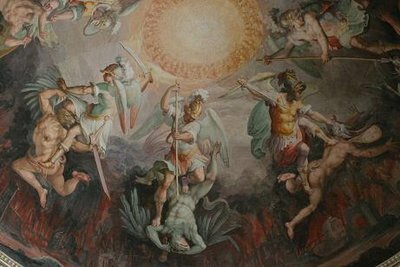 “The battle belongs to the Lord.” How will this film jump-start or change your daily prayer? The film takes up the themes of forgiveness, reconciliation, restitution (rarely seen in films! 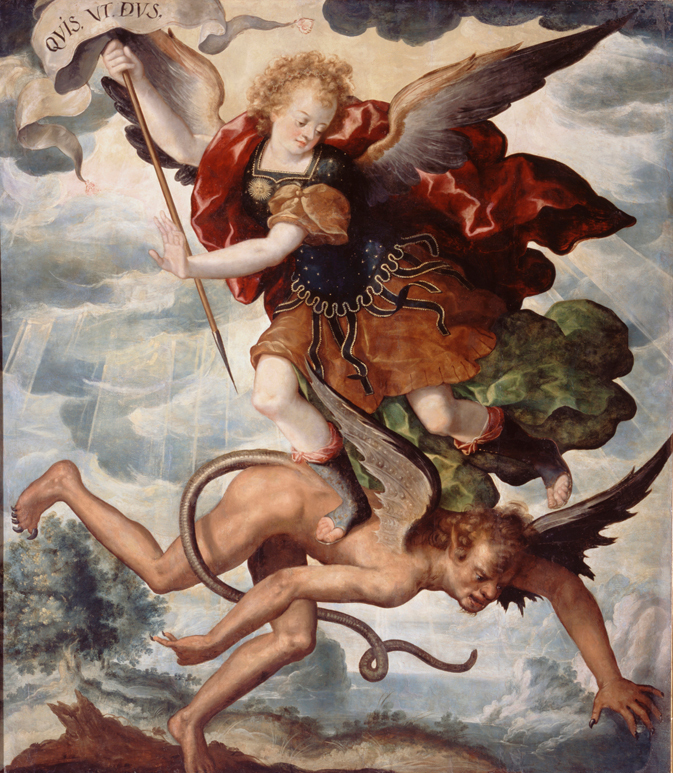 ), marriage, family, prayer and mercy. It’s the perfect film for the Year of Mercy declared by Pope Francis, beginning December 8. Bring the whole family to see this film. More than once.